See…in this picture I am a SMOOTH coat….sort of…I’m really a ROUGH coat who just got a haircut. And you’re wondering…what’s with the CONE? I walked into some thorn bushes last spring, scratched my eyebrow. My Dad didn’t even know I scratched myself. But it started to bother me. I would rub my eyebrow on the sheets, in bed next to my Dad. He said it started to look like a murder scene. 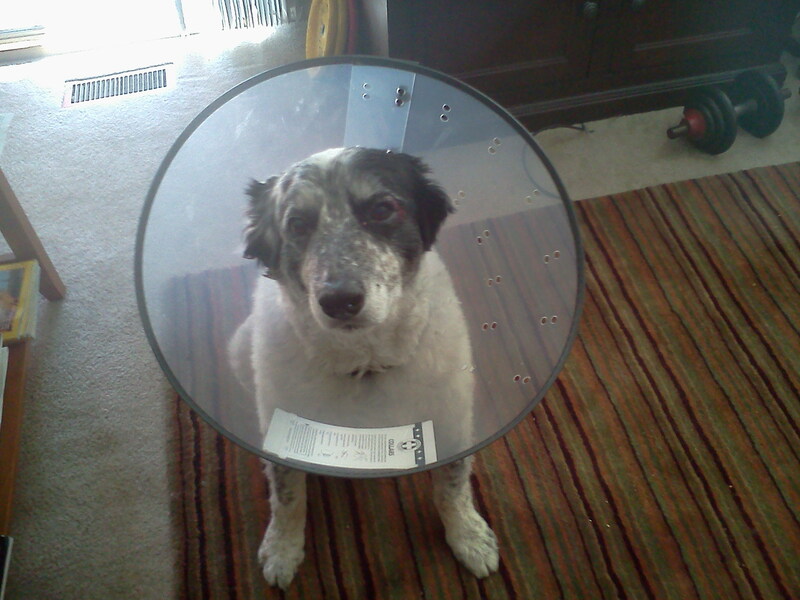 Off to the vet – they really like me there, everybody knows my name – for some salve and THE CONE OF SHAME. All better now, but I still have a scar…manly and masculine! This entry was tagged border collie, cone, cone of shame, life with dogs. Bookmark the permalink. you are still a cool dude!